Making a documentary for the German TV series Durch die Nacht mit... (Into the Night with ...), Bangkok-based filmmaker Marco Wilms got together with a wild pair, Nang Nak director Nonzee Nimibutr and In the Mood for Love cinematographer Christopher Doyle, who also worked with Thai helmer Pen-ek Ratanaruang on Last Life in the Universe (which Nonzee produced) and Invisible Waves. 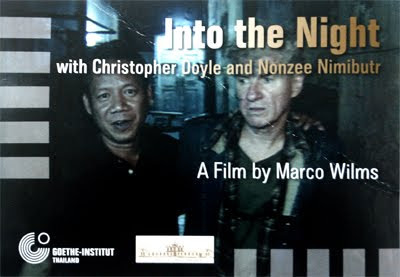 During their one night in Bangkok, Nonzee and Doyle visited the scenes and sources of inspirations for their films, including Wong Kar-wai's In the Mood for Love, which is set in 1960s Hong Kong but was actually shot in Bangkok. Broadcast on German television last year, the episode will be screened at 6pm on Wednesday, January 12 at Bangkok's National Gallery as part of the "Bangkok Noir" photo exhibition mounted by the Goethe Institut, running from January 6 to 30.